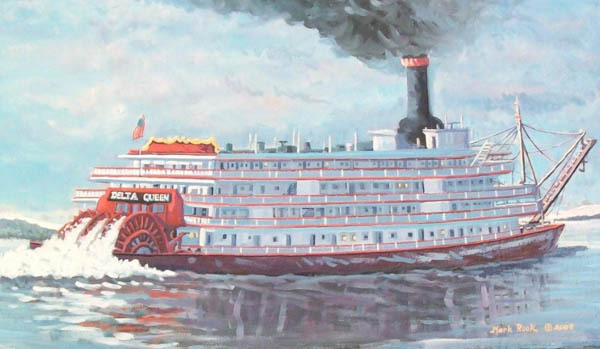 This log goes back in time, with newest entries at the top.Scroll down for links to news articles and inside gossip.We cover the Save the Delta Queen Campaign, general steamboat news and history, steamboatancestry, paddlewheel boats wanted / for sale. Anothersite to buy and sell paddlewheel boats: eBay.More Save the Delta Queen Campaign web sites:steamboats.org *save-the-delta-queen.org *savethedeltaqueen.com *Minnesotans for the Delta Queen [now offline] *DQ bumper stickers, pinsTo search this section or the whole site, go to Steamboat News Archive.If you want to post to this page, click here. rate=I do steamboat art, music, movies. As promised I'll be putting out a 2009 Delta Queen Photo calendar.I hope to have it completed & printed by the 15th of November. All the photos will be from the 2008 season.I did one four day chase in June & another two day chase in October plus seven other one day chases closer to home. All the photos are on the Ohio River. The cost will remain at $15 each which includes shipping & handling. See attached jpegs for the cover photo & thumbnails of all the photos to be included in the calendar, I took over one thousand pictures this year and blew up 132 to 8 x 10's from which I selected the 13 pictures included in the calendar. At the present time I don't know if there will be any photo-chases in 2009. Obama who signed on to support the Senate Bill for the DQ's exemption has promised us all change & I can only hope that he (being in power) succeeds in changing James L. Oberstar's way of thinking about our beloved Delta Queen. Of course the biggest hurdle is getting a new owner for the Delta Queen. Hopefully that will still happen. The ball game isn't over until it is over so the calendar will be a reminder for all of that philosophy! I am researching an old decorative plate from early 1900's. It has a large steam boat andinitial: NWSB,Co. Does anyone know of a steam boat company with these initials? Help muchappreciated. Rate the site: I'd rather be steamboating. The Delta Queen is on her last journey. Please call your Senators and U.S. Representativeto ask them to save the Delta Queen. It all rests on your phone calls. Thursday, October 30 - Memphis, 5:00-6:00 p.m.
Saturday, November 1 - Helena, Arkansas, 4:00-5:00 p.m.
Sunday, November 2 - Greenville, Mississippi, 4:00-5:00 p.m.
Monday, November 3 - Vicksburg, Mississippi, 4:00-5:00 p.m.
Tuesday, November 4 - Natchez, Mississippi, 4:00-5:00 p.m.
Wednesday, November 5 - Baton Rouge, Louisiana, 4:00-5:00 p.m.
We are with you 100% and in our website newsletter are encouraging people to write to theircongress representatives. Note in the posting below that Barack Obama is with us ... so avote for him should help with a positive outcome. What do you know about the steamer Bowling Green on the Green River? I have a photo of the ship in 1919 and the bottom deck is almost under water. Just wondering what may have happened. Anything you can tell me would be great. Thanks so much. The debate tonight, the economic situation? What is the most important issue facingour country at this time?I believe it is the Save the Delta Queen Campaign. Yesterday areporter in Europe ("Field of Ruins," by Mario Roy, La Presse, Oct. 1) stated:"The United States' only intact power today remains its culture. But for how much longer?" I can answer that question: November 1, 2008. Unless the House and Senate act this month,we will lose one of the mostAmerican of all American cultural icons: the Delta Queen Steamboat. Please call yourelected officials in Washington and urge them to save the Delta Queen (Ask yourtwo U.S. Senators to supportSenate bill S. 3498; ask your U.S. Representative to support H.R. 3852). Forty-two years ago, my father (Bill Muster) helped to win the first exemption fromthe "Safety at Sea" law, which would have killed the Delta Queen. Aside from the battle of1970 with a dishonest U.S. Congressman, the Delta Queen has easily won an estimated sixto nine additional exemptions. This is a Safety at SEA law, or a Safety of Lives at SEA law,whichever you want to call it, they are talking about SEA. Is the Mississippi River theSEA? Do they know something we do not know about the effects of global warming? "As the last remaining authentic, operable riverboat in the world, the Delta Queen is avaluable part of our nation's heritage that we have a duty to preserve and protect forfuture generations. As she makes her final stops in Point Pleasant [Ohio, Oct. 7],I urge Congress to support this effort to ensure the Delta Queen may continue to servethe people of Ohio and West Virginia for years to come." The Save the DELTA QUEEN campaign is coming around the last bend in the river. We need your help now, more than ever! Today Bill Wiemuth put together a wonderful video on the subject and posted it to YouTube.com. It is my wish everyone who receives this email will take 3 minutes out of their day today and go to the site and watch this emotionally moving video today. It is important that this video get lots of watchers to appear on as many potential viewers screens as we can get to...so please do it today! Having been a crew member of the DELTA QUEEN for 5 years and having the vessel as part of my entire life, knowing this is the possible end scares me. Many people do not realize just what the DELTA QUEEN is. True, she is machine...a steamboat. Just like the thousands before her, she carries commerce. Unlike those storied historic vessels, she has lived on...past them all! She is the ONLY original overnight steamboat left on Americas waters. She is the last of her breed....she is the last of the Mohican's, if you will! In these days of electronic instant communication and easy travel by road and air, we tend to forget the struggles of our forefathers as they did the same things on our rivers. They forged new trails, built communities, took the ideals of a nation from one ocean shore to the other. This happened in part because of the American steamboat. Please forward this information to everyone in your address book to help get the word out...thank you! Message: I am looking for info. on riverboat twlight any history or picture.